The Peterloo Massacre of 1819 at Manchester, which has often been seen as a defining moment in British radical history, will be the subject of a talk given by two historians at the National Archives (TNA), Kew, on Thursday, 31st March. Leading Peterloo experts Dr. Robert Poole and Dr. Katrina Navickas will talk about the background and events of the infamous massacre, and will also be revealing some important new sources that have been uncovered at the Kew archives. 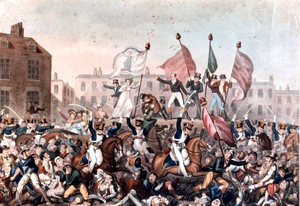 The Peterloo Massacre took place on the morning of 16th August, 1819, at St. Peter’s Field, Manchester. A large but peaceful crowd of men, women and children, estimated at 60,000-80,000, many of them wearing their ‘Sunday best’ clothes, had gathered to hear the case for reform of Parliamentary representation in Britain. 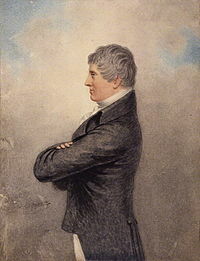 The meeting had been organised by the Manchester Patriotic Union, a group campaigning for Parliamentary reform, and it was to be addressed by Henry Hunt (1773-1835), a popular and radical orator, together with a number of other speakers. A short while after the meeting began, local magistrates urged the local military authorities to arrest Hunt and the other speakers, and also to disperse the crowd. Sixty cavalrymen of the Manchester and Salford Yeomanry, a volunteer force drawn mainly from the local Mill and from shop owners, drew their sabres and charged into the crowds, creating chaos and utter confusion, and resulting in 18 deaths and some 400-700 injuries. The youngest victim was just two years old. There was much shock and outrage across the country, especially in the north, and the events received considerable coverage in both the local and national press. Evidence emerged that some members of the local Yeomanry had possibly used the charge as an excuse to settle some old scores with ‘agitators’ and other individuals, including some of the press reporters who were covering the meeting. The massacre was given the name ‘Peterloo’ to highlight the irony that the Battle of Waterloo, fought four years earlier, had been portrayed as a defence of English liberty against tyranny. In the long term, the massacre arguably encouraged the growth of trade unionism and other forms of collective protest. After the talk there will an opportunity to view some original documents relating to the Peterloo Massacre. ‘The Peterloo Massacre: Protest and Democracy in Regency England’, will take place on: Thursday, 31st March, 2016, at: 14.00-16.00, at the National Archives, Kew, Richmond. 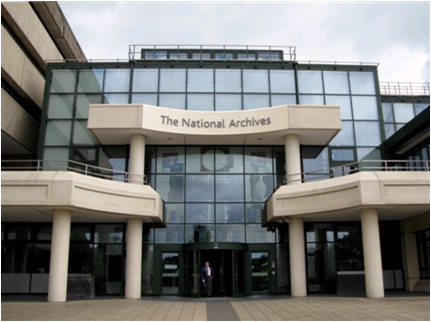 This entry was posted in Archives, British history, Events, Media history, Museums, Public History, Teaching, Uncategorized and tagged Archives, civic engagement, Explore Your Archive, Heritage, history, Public History, The National Archives. Bookmark the permalink.